I would rather see the Platform and Platform character behavior examples! Please take me there now. With the simple click of a button, you can setup your game's “Platform” behavior as well as the platform character control! As usual, create a new object. 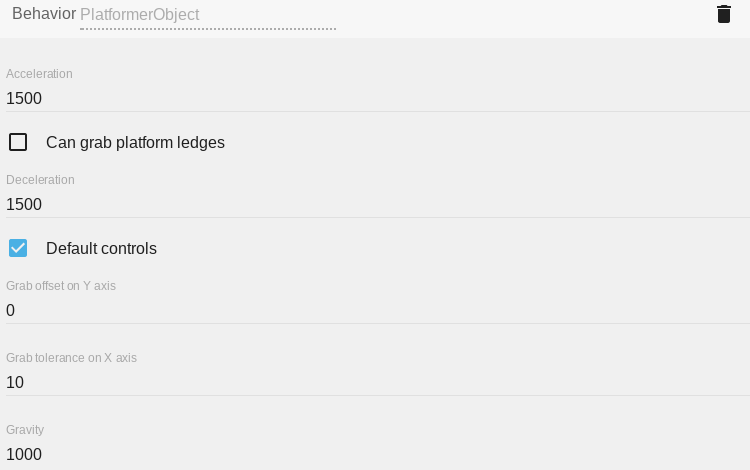 Select the object from the Scene “Objects” list by clicking on the “click to add an object” option. From the list that pops up, choose “edit object”. Select the “Platform” behavior from the list that is displayed. You can now turn your object in to a platform. Once your object is defined as a “Platform”, your “Platform character” object can walk on it. By clicking on the platform behavior, you can choose from 3 different platform types. Platform: this is the default option. The default behavior sets the object as a traditional platform. The character can collide with the platform and/or walk on it. Jumpthru platform: by choosing this option, the character can collide with the platform and walk on it, but the character can also jump thru the platform from below. Ladder: as it name suggests, this option turns our object into a ladder. The character object can not collide with the ladder object. It can not walk on the ladder object, but, when the character object overlaps the ladder object, the character is able to climb up and down. The ledge of our platform can be grabbed by default. “Grab the ledge” means that when the character object jumps close enough to the edge of the platform, the ledge can be grabbed. If you don't need this functionality make sure this option is unticked/unchecked. If you do need it, make sure the box is ticked/checked. The offset of the grab can also be changed on the Y axis. The offset option allows us to change the position of the grab to fit the animation of our character. By selecting the “Platformer character” from the list, we can turn our object in to a “Platformer character” After selecting the “Platformer character” option, you will be presented with the Platformer character properties/parameters. You may need to scroll to see all the options. The Platformer character behavior comes with default keys set to control the character. These keys are the arrow keys and the shift key. If you don't want to use the default controls, you need to turn off the default controls by unticking/unchecking the “Default controls” box under the “Platform character” options. As with the Platform Behavior, we have the a “Grab the ledge” option for the “Platformer character”. This option allows the character object to grab the ledge of the platforms. The option is disabled by default. To enable it tick/check the box in the options list. If you decide to enable this option, the character can grab the ledge of all of the platforms that also have this option enabled. Again, as with the “Platform Behavior”, we can set the grab offset on the Y axis for the character. Unlike the Platform Behavior, we can also set the grab tolerance on the X axis. By changing the grab tolerance value, we can set how close the character needs to be to the platform in order to allow the character to grab the platform object. By changing this value, we can set the maximum angle of a slope that the player can climb. The default is 0. 0 default means the character can move only on flat surface. 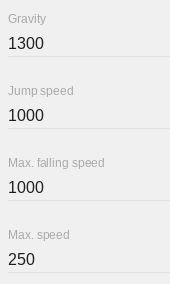 By changing the corresponding values under the “Speed and Gravity” options, we can change how fast our character accelerates, decelerates, moves, falls and jumps. I believe these options are self explanatory so I don't think they require much explanation. If you want to slow the character object down, you can decrease these values. If you want to speed the character object up, you can increase these values. All the options here can also be changed using events at any time during the game.